October 4, 2018 - Sister Judith Ann Duvall, O.S.F. As we celebrate his Feast Day on October 4, however, it’s a good time to reflect how his example can positively influence the lives of everyone, every day. 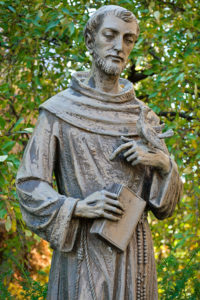 Statues of St. Francis, like this one at the Ministry building in Peoria, dot the campuses of OSF HealthCare to remind Mission Partners and visitors of the example of St. Francis. I have a favorite story that comes from the early writings about St. Francis. One of his closest companions was Brother Leo, would get discouraged at times. Brother Leo asked Francis to write something for him that would lift up his spirits. May the Lord let his face shine on you and be gracious to you. May the Lord show you his face and bring you peace. The Lord bless you, Leo. This blessing was so comforting to Leo because it reminded him of God’s presence in his life, and the peace that comes from that presence. This gift is for all of us, too. Our Sisters sing this blessing as a gift to our Mission Partners, wishing them God’s presence and his wonderful peace. Francis was known as the person who most patterned his life after that of Christ’s. It was his joy to follow the poor and humble Christ. Francis was known to practice the virtue of poverty to a high degree, owning no property, living very simply, begging for his food, living among and caring for those who were ostracized from society. He treasured Holy Poverty and guarded it carefully because he wanted nothing to get in the way of the greatest possession of all – God. Even though we are not called to follow his example to that extent, we, too, should never forget that God is and will always be our greatest possession. Francis spent his life serving others after the example of Jesus, who said: “I have come to serve, not to be served.” He freely gave to those in need from whatever he had. A way to honor his memory is to reach out to those in need with the gift of your time or treasure through one of the many service organizations in our communities. Another way to take on his spirit today is to see each individual you encounter as your brother or sister, with inherent dignity, created by God and deserving of your respect and loving concern. Every human life is a gift. Each of us is a gift. The world is a gift. ALL is a gift from the one primal source, God, the GIVER OF ALL GOOD GIFTS. To know that we are gifts, makes thanksgiving possible. To recognize that we have been created by the free act of God, is to know that we are LOVED. View all posts by Sister Judith Ann Duvall, O.S.F.